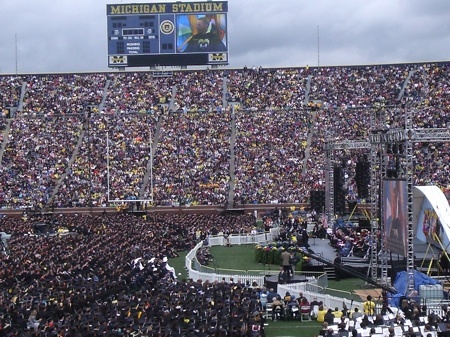 Barack Obama addressed 90,000 people Saturday at the Big House, the University of Michigan’s football stadium, where he was greeted warmly by the largest crowd to hear the president since the inauguration. 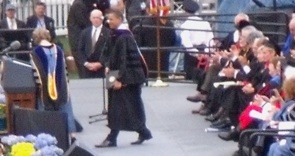 Among the nearly 10,000 graduates was my daughter Kayla. The university is a place of innovation, stability, and optimism in a state that has endured more negative consequences of the recession, and the underlying transitional factors that caused it, than any other. The evidence list is long and familiar. Detroit is losing 10,000 residents a year, and is home to less than half as many residents as it had in the 1950s. The state is just one of two — Rhode Island is the other — that is losing population. Joblessness is high. Incomes are low. Most of Saturday’s graduates will begin their careers outside Michigan, where we’ve been sending our best since 1990. For two decades in a row, Michigan has been a national leader in exporting its brightest young minds. The obvious answer is no. They’re not. In the public arena people behave poorly, rudely, aggressively, with insolence and anger. “Part of what civility requires is that we recall the simple lesson most of us learned from our parents: Treat others as you would like to be treated, with courtesy and respect,” said Obama. Of course, there is more to it than that. Obama described a democracy that has tilted dangerously because bad behavior draws the attention of both parties, the news media, policy makers, and seems to encapsulate the boiling energy of the era of transition that has enthused some and worried most. The point resonates with me. I just spent three months working with a utility in northern Michigan that wants to do a good thing –– generate 30 percent of its power with local renewable resources by 2020. Despite that goal, the utility was charged by some members of the community, and the major daily and weekly newspapers, with the equivalent of environmental genocide. A 10 mw combined heat and power wood biomass generating station would lead to forest “slaughter,” “toxic” ash, and all manner of “cancer causing” pollutants. None of these is true. As a member of the team that designed and executed a communications and public engagement process to accomplish the utility’s goal I personally was described by such lovely phrases as poseur, sinner, liar, shill, hypocrite and a few more choice words too. And that was from environmentalists I’ve worked with for years. “The problem with it,” said the president, “is not the hurt feelings or the bruised egos of the public officials who are criticized. Remember, they signed up for it. Michelle always reminds me of that. The problem is that this kind of vilification and over-the-top rhetoric closes the door to the possibility of compromise. It undermines democratic deliberation. It prevents learning –- since, after all, why should we listen to a “fascist,” or a “socialist,” or a “right-wing nut,” or a left-wing nut”?